Yaesu FT-70 - portable dual-band 144/430 MHz digital-to-analog radio station with a power of 5 watts. Yaesu FT-70 can work in both analog FM mode and digital Yaesu System Fusion C4FM. Owners note the high quality of modulation of this radio, and very loud, high-quality sound from a 0.7 W speaker. In C4FM digital modulation mode, high sound quality is achieved through excellent coding technology, and monitoring and error correction functions. The indicators at the top of the Yaesu FT-70 radio station change color depending on the mode of operation. Yaesu FT-70 has the function AMS - recognition of the received signal, and automatic transition into the received mode - C4FM or FM. 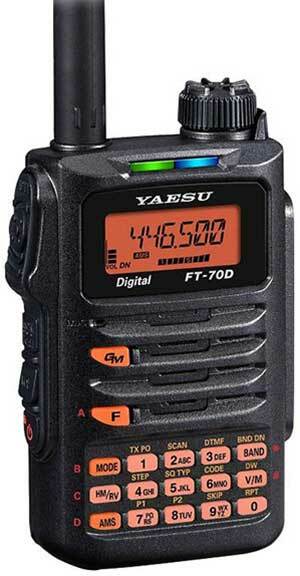 When working in C4FM, Yaesu FT-70 broadcasts the call sign of the operator and the radio ID. Complete absence of ethereal noises, and the ability to communicate with the whole world by connecting to the nearest node, or by creating your own node.